WanderMan: Equal Time For Tea Brewed In The RV! OK...I admit it, sometimes I like to drink hot tea. As a die-hard coffee aficionado, it surprises some folks that I also drink tea. There are literally, thousands of varieties of tea. Some have even more caffeine than coffee! How's that for news? Obviously, tea with some honey is very soothing for your throat, especially if you are sick. Being on the road and having a cold or flu is already miserable enough. A warm cup of tea is quite comforting. I've covered boiling water for brewing and tea before so I'm not going to get too deeply into that aspect, but what about neat tea gizmos? The other day I stumbled across a tea accessory I simply couldn't refuse. Many folks like to use infusers to brew their tea. These come in many shapes and sizes. Typically they can be the generic "tea ball." 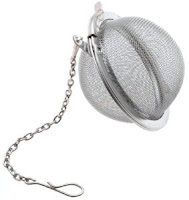 This is a small metal ball that comes apart into two pieces (or is hinged) to allow the tea leaves to be placed inside. It has a chain with a small clip on the end to keep it from falling into the cup when it's steeping. Nothing special. It works and they are really inexpensive. I have a few. Well, what if you'd like to introduce a bit of "whimsy?" The one I found is in the shape of a NASA Gemini space capsule and the chain ends with a space-suited man! Very cool. He's designed to hang on to the rim of the cup and keep your infuser from getting away from you and over-brewing the tea. The capsule opens at the bottom (the heat shield?) with a half twist. There is ample enough room inside for a healthy dose of tea leaves. Simply open it up, load the tea and drop it into the hot water (or pour it over, etc etc.) After I saw this tea infuser a while ago, I knew I had to have one! Unfortunately, it was way too much money to spend on something that duplicated the functionality of one I already had. I mean it was $19.99 and my regular ones were only .50! Big difference. Now, I will pay a premium for whimsy...within reason! It popped up on sale for $4.99 and that made it much more reasonable. After using it a couple of times....it's actually fun. The spaceman bobs up and down a bit on the rim and the capsule rests nicely on the bottom or hangs in the liquid nicely. Oh, and it makes good tea as well! Once in a while, I'll go for something that isn't just functional. It has to still perform that function, but in a more interesting way. It should look cooler or maybe do its job in a more complex and fun to watch way. This little beauty fit the bill nicely. Look around, you may find lots of little things to make your life on the road more interesting and fun! You didn't mention which tea you drank. Did you drink American grown tea? Did you know there was such a thing? American Classic Tea is grown at the Charleston Tea Plantation on Wadmalaw Island, SC. A subsidiary of Bigelow Tea, they produce a very nice tea. Its also an interesting place to visit. And its made in America! My wife made me a very nice xmas gift with a couple of cans of my favorite, Charleston Breakfast.